The Most Famous Example Of A Cryptographic Rotor Machine Is The? Which Of These Pine Tree Species Require Forest Fires To Propagate? Long before the advent of digital encryption, there were mechanical encryption tools. The most famous example of mechanical encryption tools was the Enigma machine, a device known as a “rotor machine” that used an electro-mechanical stream cipher to encrypt and decrypt messages. Patented in 1918, brought into production in the 1920s, and made popular by world-wide military use (most notably and infamously by Nazi-run Germany in World War II), the Enigma series of machines peaked at around 100,000 production units. 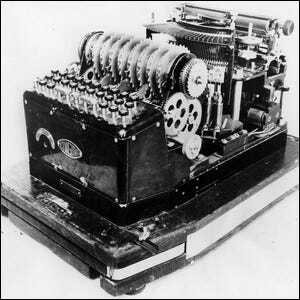 Although the Enigma code was cracked during World War II and the devices eventually fell out of popular use over time, the public remained largely unaware of the Enigma machines, the role they played in World War II, and the great lengths the Allied forces went to in order to crack the German Enigma codes. Upon declassification of the information in the 1970s, there was a surge of interest in the devices. Today, the majority of the remaining machines are found in museums and the hands of private collectors. If you’d like to see an actual Enigma machine in action and learn a little bit more about the math behind it, we recommend this Numberphile video on YouTube. Image courtesy of the Enigma: Decipher Victory Project.